If I had to guess I'd say the biggest pagan conference in America is probably Pantheacon, an event that happens each February in San Jose California. 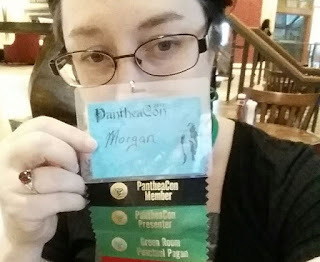 I had attended my first Pantheacon in 2015 and honestly didn't think I'd go to another since traveling to California is a bit of a challenge for me, logistically and financially, but somehow I found myself back there again this year. It will be my one big travel thing for 2017, and the only other event on my schedule is the Morrigan's Call Retreat. Unlike my first time at this event, this time around there were some notable difference. Firstly although I once again taught a workshop in the ADF hospitality suite I was also on the main schedule with 3 presentations, and I had a book signing. Also unlike the first time I was staying in the Doubletree itself, not in one of the overflow hotels. Both of these things were rather significant changes. I was really happy (and honestly quite surprised) to have had my workshops chosen for the main schedule but teaching a total of 4 classes and having the book signing made for a busy conference. I was also staying in a hospitality suite - East Coast Pagans Hospitality Suite to be exact - and so most of the time when I wasn't teaching something I was there. In practical terms this meant that I didn't have very much time to visit other hospitality suites or get to many workshops. 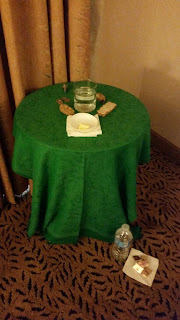 I did attend one RDNA style ritual in the ADF suite which I really enjoyed. I'd never done anything in that style before and it was very interesting to see the similarities and differences in how it was structured. I've been a member of ADF since 2001 and I always like spending time with other ADF members, especially people I know online but don't see often in real life. It was fun teaching a class on the Irish Gods in their suite, and I liked the questions and discussions that followed. As I could say for many things at the conference, I wish I'd had more time to spend there. My main spiritual contribution in the East Coast Pagans suite was to maintain an altar there for the Otherworldly spirits. Usually when I travel I have some small place set aside for the deities and spirits I honor but I think because this was a space open to the public for 8 hours of the day it required something more elaborate. People were able to leave things on this one, and regular offerings of butter, fruit, and water were being made as well. I quickly made friends with the local crows disposing of the old offerings each morning. I didn't have much time to socialize but I did find a few moments to get out to some of the other rooms nearby. I was able to visit the Heathen Hospitality suite, which I am so glad I did. I met several Troth members in person who I have only previously known online (having been a Troth member since 2006). They also had some of the best ribbons, in my opinion. Again I wish I'd had more time to spend there, particularly since I have a trip to Iceland coming up in 2018 that several people from that suite are also going on with Land Sea Sky Travel. I was also able to briefly stop into the Sisters of Avalon suite and visit with some familiar faces as well as picking up a very cool new oracle deck. Pantheacon in general offered a chance to meet some new people, reconnect with friends, and meet people in person I'd previously only known online, which was a wonderful experience. I did find some time, eventually, to have some fun and to hang out with friends, to share stories and to create some new phrases including 'when in doubt cattle raid' and 'no fadas given', although my favorites may have come from my friend Jon of An Scealai Beag who was the source of such quotes as 'Dagda approves'. One of the best things about the conference, I think, is that so many people attend from so many places and from so many different pagan/polytheist approaches that it allows for a lot of diversity and experiencing new viewpoints, as well as connecting to people from all sorts of different traditions and areas. And of course competitive ribbon collecting. I attended one class which was taught by Lora O'Brien about Medb of Connacht which I highly recommend; Lora also offers the class online here (you may have to scroll down a bit to find it, but its there). Lora had a meet and greet/book signing afterwards and we had some time to talk so there was a bit of crossover between the class and that. I found the ideas brought up really intriguing, including the idea that Medb may have been both a name as well as a title for a priestess at Rathcroghan, and that Medb could have been active in warrior initiation rites. There's speculation in that last of course, but there is certainly a tenuous pattern of male warriors being trained in myth by female warriors* that could indicate a wider socioreligious pattern. Naturally being me I ended up getting a bit speculative about the meanings of Medb's sisters' names and why they may or may not have been fit rulers compared to her based on name etymology. That aside though it was a great class and I'm glad if I only was able to attend one in its entirety it was that one. My own classes went well, as far as I can judge. The first was meant to be on land spirits and house spirits but ended up being a bit more on land spirits. I did one in the ADF suite, as I mentioned, on the Irish Gods. 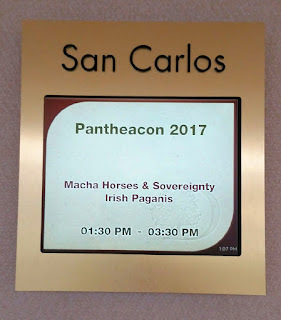 The second official Pantheacon workshop was on Macha, horses, and sovereignty in Irish culture. And finally I had one on the darker side of Fairy, which was looking at the Unseelie court , who and what they are, and how we interact with them. Turnout seemed good, the audiences were engaged and quick to ask questions, and for the most part we covered all the material I wanted to touch on. Pantheacon is always an adventure, both the travel to get there and then the experience of being there itself. There are great workshops and diverse hospitality suites, vendors and adventures to be found. As with the first year I attended I think my favorite thing was the experience of community, of being able to spend time with friends I don't see often, or ever, and to relax and discuss everything from theology to linguistics with people who share those interests. *examples could include Fionn and Cu Chulainn who were both trained by female experts in warfare; more widely in the Ulster cycle we see not only Cu Chulainn but also Ferdiad and Connla similarly trained by women, albeit the same one. Hexing is one of those things that some people feel comfortable doing and others disagree with. 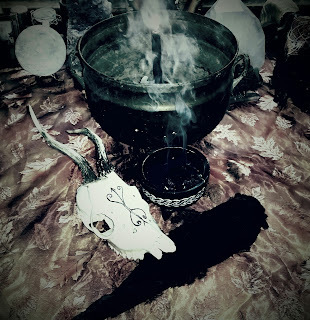 This post isn't about the ethics pro or con, but purely offering some safety tips for people who may feel motivated to hex and who are not well versed in the practice. Like any other magical specialty it is a niche practice that requires its own study - in my opinion - to do well. And like most magical specialties if done wrong a person can potentially cause themselves some serious problems. First lets clarify some terms. Technically hex just means to use magic but it's taken on connotations of harm that make it in common usage synonymous with cursing, ie to use magic to inflict harm or punishment on someone. I use the two terms interchangeably in English. In many views both binding and banishing magic falls under the purview of hexing/cursing because they involve forcibly altering another person's freewill. Binding means magically controlling someone's actions, often by limiting what they can do; banishing means sending them away from an area or keeping them away from a person or situation. Hexing in general terms can be a diverse practice that may involve a wide array of methods intended to affect a person in a negative manner, often as a means to achieve justice*. If you are calling on deities of justice or associated with justice, be 100% sure you are innocent in the situation. Generally speaking just because you invoked them doesn't mean they won't weigh your actions as well. Justice is their thing after all. If you are invoking other types of spirits that historically expect to get paid make sure you pay them something. Most spirits don't work for free, unless you go the route of calling them and binding them to your service which is a whole other conversation. Spirits will help you out but they expect something in return, so offer it to them up front. If you invoke, you dismiss. Don't just open that metaphysical door and leave it swinging in the wind. Make sure you show your guests out and close and lock that door when you are done. Keep your wording consistent. If you are using positive language like 'may he be destroyed, may he lose his prosperity' or whatever then stick with that throughout; if you are using negative language** like 'may she be without rest, may she be without peace' stick with that. Don't mix and match the two, it muddies the waters. Keep your intent consistent. Focus matters. Don't try to cram in a variety of goals in a single working, just stick with a single strong intention and be clear on exactly what your intended outcome is. Be really clear with your symbolism and know what you are using, what it represents, what its associated with, and any possible deeper layers of meaning that could apply. Don't use foreign symbols or items that you don't understand or know the meaning of. As long as you believe you know what a symbol means or you have a strong association with it that's fine. Although there is a lot of historic precedent for using languages you don't speak yourself, I don't personally recommend it. If you don't know what you are saying, don't say it. Be specific in naming your target. Do not use your own name especially if you are invoking spirits. This is what magical pseudonyms are for, and no I don't mean your True Name - you guard that like your ATM pin number - I mean that magical name that you share around like free candy. The one that has no real meaning for you. That one. If you don't have one make one up. Think of it as a hexing code name. If its a binding be aware you are tying yourself to the person, thing, or situation. Consider whether that's your best option. If its any other type of hex be willing to accept whatever consequence results from it. Always cleanse afterwards and double down on your own protections. A basic classic hex*** would go along the lines of: "Spirit of ---- I call you to punish (person's name) who has (done X) and caused me (this specific harm). 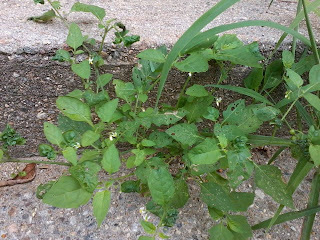 May they suffer (lack of sleep and lack of peace, etc.,) until (item is returned/they are sorry/justice is done/etc.,). In the name of --- I offer (specific offering) let (person's name) be brought to justice." We also have a wide array of maledictions and satire to look to for examples of traditional hexes in Celtic culture. These usually combine physical actions and spoken charms. Similarly the Norse culture offers an array of cursing options we can look to for examples of how it's done in that tradition. These all help provide guidelines for ways to hex safely. *historic, mythic, and folkloric examples of hexing often are predicated on attempts to restore social order or avenge harm done to people who have no other recourse. Often, but not always. **some people prefer to avoid negative phrasing altogether but there is some precedent for it, for example in Irish satire practices. cen díl dámi resi, rob sen Brisse ‘Ni fil amain tra Bresi", ol se. Ba fir on dano. Ni boi acht meth foairi-sim ond uair-sin. Conad si sin cétnae hoer doronadh a n-Erinn. The poet went on a journey to seek lodging at the house of Bres, to wit Corpre mac Etoine, poet of the Tuatha Dé. He arrived at a house, small, constricted, black, dark moreover without a fire or equipment or bed there. An envoy brought three small cakes, indeed they were dry, on a small sad dish. He rose thereafter on the morrow, and he was not thankful. There is nothing moreover thus in Bres," he said. It came to pass truly as well. Nothing but decay was on him from that hour there. That was the first satire that came to pass in Ireland. One of the things that witches in Ireland and Scotland were known for was shapeshifting, particularly into the form of hares, although some other shapes were noted in folklore as well including weasels. From a modern perspective there is a tendency to interpret these stories literally, and indeed some of them clearly indicate a literal transformation, such as we see in the 'Witch and Hare'. However many are more vague and could be interpreted as a practice of mental projection into an animal, rather than the human witch physically transforming into the shape of one*. It may also be that these stories represent a projection of the witch's spirit which would appear as an animal, rather than a literal animal. For modern witches who study traditional practices or who are interested in some of the skills attributed to historic witches this shapeshifting is certainly worth consideration. Looking at folklore sources and witchcraft trials we might surmise this was a type of mental or trance practice, where the person learned how to project their spirit out into either an existing form or into the image of an animal (literal or figurative). Claude Lecouteux in his book 'Witches, Werewolves, and Fairies: Shapeshifters and Astral Doubles in the Middle Ages' discusses at length such a practice, wherein the witch appeared to be sleeping but the witch's spirit was wandering abroad, sometimes in human form sometimes not. During these nocturnal expeditions the witch might gather information, meet with other witches or spirits, work magic, or simply wander freely. From a modern perspective there is no reason to think witches can't still engage in this type of trance practice, although it may be easier and easier on a person's ethics to learn how to project one's spirit out in animal form rather than learn how to take over another being's physical form. 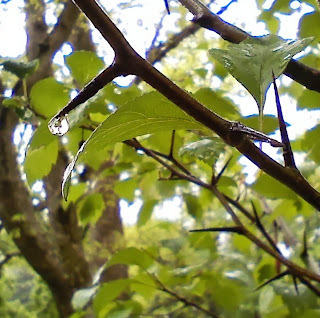 This would not be a basic or beginner skill but something to look at doing once you are fairly comfortable with the basics of sending your spirit out from your body safely (and returning safely), spiritual journeying in general, and how to handle any emergencies that might come up while in a human form. This is important because trying any of that in a new shape is going to be harder and inherently have more risk to it, and you need to be confident that if anything goes wrong you know what to do to fix it. Looking at one of the only existing chants we have today from a historic witch, Isobel Gowdie, who claimed to deal with both the Devil and the Queen of Elfame, we see the ambiguous nature of the practice. This template also gives us a good idea of what we might want to base a structure for such a chant on as well. Some people may not see the value in this sort of thing but for a practice like this having a set ritual approach to it can add a layer of safety by providing the mind a key, if you will, to going into and out of the shape. Ay while I come home again." This was still a dangerous practice that risked injury to the person, and the many folktales of witches who were harmed in animal form and then had the same injuries in their human forms show this. While we can, of course, interpret this as another indication of literal transformation we could also view this as a way in which the mind influences the body; the mind or spirit being injured in one form convinces the physical body it was also injured. From a metaphysical perspective this holds with the principle that what happens to us Elsewhere affects us here, while from a psychological perspective it reflects the power of the mind to influence the physical body. Many of us may be familiar with the more positive aspects of this which we see in things like placebos healing people because the people believe they will, but as with everything there is another side of that as well; what we believe hurts us can indeed hurt us. Shapeshifting is a skill that witches have claimed and has been claimed of them for a long time. It is also something that modern witches can through different means still practice today. This blog has only looked at one potential method for witches to shapeshift, as a suggestion for those who are looking for either more advanced topics to study or new skill sets to branch into. As with so many things done by the traditional witches of the past though, this was not a safe thing and it came with no guarantees. Keep that in mind if you do decide to study this further. *for those of you who read Terry Pratchett you'll be familiar with this concept as he writes about his witches doing it. It's what Granny Weatherwax does that they call 'borrowing'. This story is listed in the Ulster cycle, although it does not directly tie into any of the other stories there. I wanted to translate it here because I find it an intriguing piece and really enjoy the amount of description it includes. I have kept to more literal translations here to give the reader a feel for what older Irish language idioms are like and more generally what the flow of the older texts reads like. Baí goba amra i nUltaib .i. Eccet Salach goba a ainm. Ainm n-aill do Echen. suí cech admait. conna rabi riam liarum goba bad ferr. Rucad iarum mac dó. Amairgen a ainm. Ro buí iarum in macsin i mmacrai cethéora mbliadna déc. cen labrad. Ro ás a. brú iarum combo méit adbul teig móir. & ba feithech glasremor in brúsin. & a smucli asa sróin inna beolu. Ba dub a chroccend. Batir gela a fiacla. Ba glasbán a aged. Amal da urbuinne builg goband a lurgne & a sliastai. Batir laebladracha a thraigid. Batir adbolmóra a adbronna. Batir ardda imchiana a da ngruad. Batir domna dubderga a dí súil. Ba lebormailgech anúas. Ba garb drestaide a folt. ba mellach cnámach carrgarb a druim. Nibó cáemduine samlaid. Dia follaigthe cu ciana inna suidiu cen foglanad doacmaised a múrtraide dó cotice a di leiss. Batír é a sercla gruth bruithe. mór luatha. mera derga. caera glassa. diasa loscthi. gais chrema. cnoi caecha a mbith for clár oca oca airfitiud. Dofoíd iarum Athirne a gilla .i. Greth a ainm co Ecet Salach do chor béla i tenid. Co n-acca Greth in n-arracht ndóer ndochraid ísin ara chind for lar in tige. Danéci co anmín. atrágestar Greth. Buí ingen Ecit i cathair cumtachtai & tlacht derscaigthe impe issin tig. & sí a hoínur oc comét in tige. & in mac na fail. Co cualatae ní in mac fri gilla nAthirni. In n-ith Greth gruth ol se fo thrí. Niro recart Greth. & atrágestar co mmór. Asbert im frisseom arisi. Grínmuine gránmuine gais chrema. cuae uinn. ubla greti. gruth. in n-ith Greth gruth. Athirne cindas both isind liss. Adfét dó in gilla uile amal luide Greth assind liss. Tanic Ecet fo chetoir. Asbert a ingen fris. Ro labrastar Amargen indiu ol si fri gilla nAthirni dodechaid sund do denam bela lais. Cid asbert friss. In n-ith Greth gruth. &c. Bid ed bias de ol Ecet. Ticfa Athirne do marbad in meic arna ragba fair. ar biaid mór sóis ocun mac ro rádi in sein. Dotet ind ingen iarum cosin mac lé assind liss dond airgi buí oc Sliab Mis tess. Dogní Ecet deilb in meicc di chriaid & suidigis fo láim chlí dó etir & a builg. & dobert dagthimthach imbi. & suidigis inna liugu amal bid ina chotlud no beth. Tic Athirne iar sin & a gilla Greth. Co n-accatar in mac inna thálgud. Dognith a mbieil leo. & batar ro maith & adacht for samthaig. Dambert Athirne imma chend na delba ucut amal bed in mac beth and. & atnaig do for teiched & eigther impu. Lotar in tsluaig ina ndiaid. Tecmalla Aithirne a folad & a inmass issin less. & gabtha fair a les. Tecait Ulaid gleithir eturru. Doberar .uii. cumala & log a einig dó & dognither cora eturru. & gaibid Athirne in mac for altram .i. Amorgen & legais suithe filidechta laiss. Conid iarum ro laig senordacht for Athirne & ro gab Amorgen ardollomnacht Ulad. There was a famous smith in Ulster that is Ecet Salach [Ecet the filthy] was the smith's name. His other name was Echen. Every skill was his so that before or after there was no better smith. He had a son, Amairgen was his name. The boy went fourteen years of his childhood without speaking. His belly grew almost as vast as a huge house and it was sinewy, thick-grey and flaking. The mucus from his nose went to his mouth. His pelt was black. His teeth were white. His face was pallid. Like the two bellow-bags of a smith were his shins and his thighs. His feet had crooked toes. His ankles were huge. Both high and very long were his two cheeks. Deep, dark red were his two eyes and drooping down. Coarse and thorny was his hair. Humped, bony and scabby was his back. Thus he wasn't an attractive person. Because of long neglect while he was sitting without clearing away his excrement [it] would reach to his thighs. His delicacies were cooked curds, salt, red berries, green berries, burned ears of corn, sprigs of wild garlic, empty nuts for his meal which he entertained himself with at his table . Then Athirne sent his servant, that is Greth was his name, to Ecet Salach to forge a battle-axe in the fire. Then Greth saw the ignoble ugly specter there before him on the floor of the house. He looked with harsh dread at Greth. Ecet's daughter was in the well-made building and a distinguished garment about her in the house. And she alone was guarding the house and the boy in his place. The boy was heard saying something to Athirne's servant. "Does Greth eat curds" he said three times. Greth didn't answer and greatly feared. He spoke to him again. "Blackberries, sloes, sprigs of wild garlic, pine nuts, apples, curds. Does Greth eat curds." Greth ran from the house, with a cry across the bridge of the fort into the mud. Then he returned back to Athirne. "He sees warriors," said Athirne "an evil appearance is on you." "It's expected for me," said Greth. "A boy who hasn't spoken before for fourteen years spoke to me today. And unless he's removed the lad will extinguish your many grades." "What did he say to you" said Athirne. Athirne asked how many were in the hut with him. Greth told that the other servant went out with him. Ecet went back to the building. His daughter spoke to him. "Amairgen spoke today," she said. "to the servant of Athirne sent here to ask you to make an axe." "What did he say to him." "I know what will come of this." said Ecet. "Athirne will come to kill the boy so he will not prevail over him. Because there is great wisdom with the boy who reflects on that." The girl went and took the boy with her out of the fort with their herd of cows to Sliab Mis in the south. Ecet made the form of the boy from clay and set it by his left arm between him and his bellows. He placed good clothing about it. And set it sleeping as if it were a living thing asleep. Athirne went there then with his servant Greth. They saw the boy looking soothed. Their axe was ready for them and it was good and they took the axe. Athirne brought it down on the head of the figure there, as if doing violence to the boy's life there. And they fled the house with a cry about them. The host went after them. Aithirne assembled his wealth and his treasure there with him and secured his fort. The Ulstermen went [and] settled around him. [Ecet] was given seven cumals* and acquired his honor price and an agreement was made between them. And Athirne took the boy in fosterage, that is Amairgen, and he studied poetry with him. Thereafter Athirne's precious seniority was lost and Amairgen was the highest poet of Ulster.